According to official documents seen by EurasiaNet.org, the objects of suspicion can include suspected religious extremists or would-be potential terrorists. But the target list also includes electricity thieves and anybody using the wrong type of lightbulb. In apparent disregard for due process, the teams, which can number up to 15 officers from the police, prosecutor’s office and State Committee for National Security, are demanding to search people’s homes without proper authorization from the courts. The initiative is part of something known as “Operation Order,” and it is focused, for now, on parts of the capital, Dushanbe. 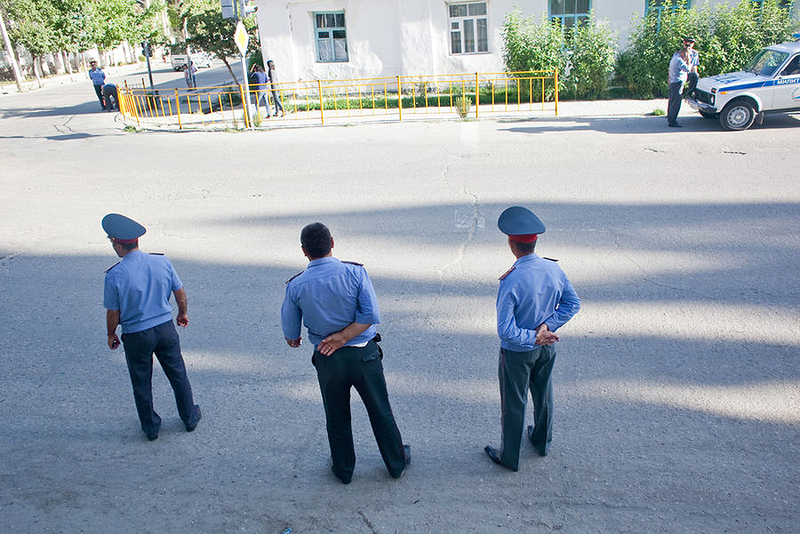 A resident of the city’s Ismoili Somoni district told EurasiaNet.org that three law enforcement officers visited his home on June 3 demanding to be allowed in to carry out checks. The man refused, arguing that the officers did not have the requisite paperwork. “The following day, a commission of 15 people came with an official document signed off by the General Prosecutor’s Office, the Interior Ministry and the State Committee for National Security. They came into the house and checked anything it was possible to check,” the resident told EurasiaNet.org on condition of anonymity. According to those that have undergone similar experiences, nothing is too trivial too evade scrutiny. Power cables are inspected to ensure no unmetered electricity is being siphoned off the grid. Since the end of last year, city authorities have stepped up inspections to ensure proper storage of propane cylinders, which are used in many households for cooking and heating. In 2009, in a bid to reduce nationwide electricity consumption, Tajikistan banned the sale of incandescent lightbulbs with power ratings of 100 watts or more. All the same, the offending lightbulbs are routinely smuggled into the country from neighboring Kyrgyzstan. Anybody found in violation of any of these statutes can face anything from fines to administrative sanctions. There is a 10-page “Operation Order” document that authorities now wield to legitimize their house searches. The big-ticket targets outlined in that document are suspected members or sympathizers of what the government deems terrorist and extremist groups. Along with more obvious suspects like the Islamic State group and Jamaat Ansarullah, organizations like the banned Islamic Renaissance Party of Tajikistan (IRPT) and the opposition Group-24, or even associates of Abduhalim Nazarzoda, a former deputy defense minister that authorities claim mounted an attempted coup in September 2015, are in the crosshairs. Young men with beards are suspect, as are women in overtly Islamic clothing styles. Any discrepancy between ID photos and appearance is particularly frowned upon. The sweeps are being cast in part as “clarification work.” Teams inform members of the public with whom they come into contact what kind of behavior they should pursue and avoid. An Interior Ministry representative told EurasiaNet.org on condition of anonymity – because he is not authorized to speak to the media – that the operation is being extended to the whole country and that districts around Dushanbe have already gone through the exercise. Even so, authorities have issued no public notices about the sweeps, meaning people only learn about the nature of the inspections when teams arrive at their front door. “We didn’t send around notifications beforehand, because Interior Ministry representatives also introduce themselves before entering a home anyway. And even without [authorization], any precinct has the right, when necessary, to enter homes and check on what is going on there. That is our daily work,” the ministry official told EurasiaNet.org. Political commentator Farruh Avezov told EurasiaNet.org that although campaigns to enforce lawful behavior are to be welcomed, authorities ought to have pursued less invasive and punitive methods. “When you are implementing some or other measure, the people enforcing the rule should have some goodwill and desire to improve the situation, instead of just handing out fines. Fines are a heavy-handed way of solving the problem that is intended to scare anybody into not stepping out of line,” Avezov said. Ostensibly basing their reasoning on the need to combat terrorism, authorities have been – not always successfully – seeking to expand the ability of security officials and law-enforcement officers to act independently of other government agencies in their interactions with the public. Lawmakers in the lower house of parliament in October approved legislation allowing agents with the State Committee for National Security (GKNB), the successor agency to the KGB, to enter people’s homes without permission or obtaining a court order. GKNB chief Saimumin Yatimov described the legislation as a measure of last resort. “Special services employees will only get the right to gain unauthorized entry into the homes of citizens in exceptional cases. For example, when there is the threat of a terrorist act and there is a need to protect the life and health of the population or to seek the release of hostages,” Yatimov told lawmakers. In a surprising and unusual turn of events, however, the upper house, or Senate, rejected the legislation in mid-February. “It is necessary to clearly set a boundary between the provision of security and the guarantee of citizens’ rights,” said Senate speaker Mahmadsaid Ubaidulloev. In a development that may or may not have been related, Ubaidulloev, a long-time regime loyalist and the mayor of Dushanbe until his firing in January, was, at the time of that decision, coming under mounting pressure from rivals. His main antagonist was, and very much remains, his replacement as Dushanbe mayor and the son of the president, Rustam Emomali. Ubaidulloev is still speaker of the Senate, a position that makes him formal successor to President Emomali Rahmon in the event of an emergency, but there is constant chatter in Dushanbe that there are moves afoot to squeeze him out to make way for a member of the ruling family to take his place. Undeterred by the GKNB law, deputies are looking at other ways to expand the ability of authorities to intrude into citizens’ private lives. On June 7, one member of the lower house, Jurakhon Majidzoda, suggested giving criminal investigators the power to identify people suspected of visiting “undesirable” websites. What would qualify under that rubric would likely be at the highly subjective judgment of agencies like the GKNB or the communications agency, which is headed by an official related to Rahmon by marriage. In support of his argument, Majidzoda claimed that people across Tajikistan are collectively being bombarded with up to 90,000 SMS messages every day from supposed extremists and terrorists. Majidzoda said the messages include appeals to join forces with radical groups based abroad. Even more sensationally, Majidzoda claimed that out of more than 3 million Tajiks who now have access to the Internet, more than 80 percent visit websites containing extremist and terrorist content. Attempts by EurasiaNet.org to find any people who had received text messages similar to those described by the lawmaker were unsuccessful.